The AeroGarden is Plug in grow bio dome.. Yes a bio dome..
Basically it will help any get some green fingers and guarantees a harvest within 28 days.. 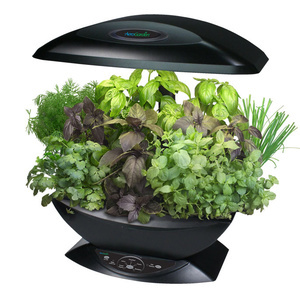 The AeroGarden come with a pack of "Gourmet herbs".. So whats it do ? well it has a computer the monitor your plants along with watering, adding nutrients and light cylces.. How cool is that ?